Create Your Clean White Spa Retreat | Alcher Interiors, Inc. This week we’ll show you how to create that beautiful white spa look you see in all the magazines – and you can have it as your own retreat to de-stress in by the holidays! Set the stage with Bistra’s white Carrera-style marbleized porcelain tile in large 13” x 13” floor tiles and 10” x 13” wall tiles to give your room that sense of spaciousness. Choose to use the coordinating 2” x 2” mosaics for the all-white look. Enjoy the look of marble without the maintenance! You could also add in a little more interest with accents in quiet, neutral colors or clear glass textures. For texture, accent your white walls with large format Glazzia’s Crystal Wave series glass tiles with a “rain” texture or Merola’s 3” x 6” Gotham super smooth clear glass tile. 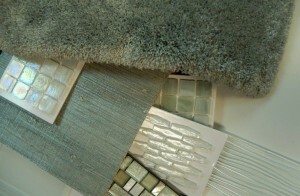 If you’d like to add a hint of soothing neutral color, look through the mosaic choices offered by Stone & Pewter Accents. Their Mizumi cloud style mosaic in Martini or marbleized 1” x 1” mosaics in ivory or silver moon are perfect choices for shower floors, backsplashes and other focal points in your retreat. Or get creative with Matise’s Smochalama Tismomb glass accent mosaics in random sizes! And if full tile walls aren’t your vision, enhance them with a quiet, gray-green grass cloth wallpaper from Decorator’s Volume 2. For the finishing touch in your spa – lay soft area carpets of Silky yarn color Portal by Nu Silk. It’s a special type of yarn that feels like silk but is easy to clean and more luxurious than you can imagine. We promise, it’s a real toe wiggling pleasure! All products mentioned in this post are 20% off for two weeks starting September 14, 2015 through September 25, 2015. Stop in today and start thinking about your spa!